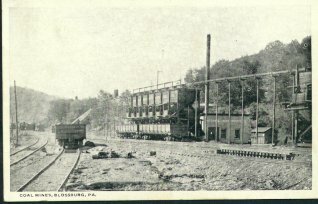 Coal Mining at Blossburg is shown in the postcard. The original limits of the township of Bloss have been so materially lessened by the formation of the borough of Blossburg in the year 1871, and the township of Hamilton in December, 1872, that substantially the inhabitants of Bloss township are to be found in the village of Arnot. The township of Bloss was formed in the year 1841, and taken from the southern portion of the township of Covington. Of the portion which now remains of the township we shall proceed to write, giving the early history of the township in connection with the borough of Blossburg. The Blossburg Coal company obtained its charter by an act of the Legislature of Pennsylvania, approved April 11th, 1866. The company consisted of Constant Cook, John Arnot, Charles Cook, Henry Sherwood, Franklin N. Drake, Ferral C. Dininny, Henry H. Cook and Lorenzo Webber. Hon. Constant Cook, John Arnot, Charles Cook, Henry Sherwood and Lorenzo Webber are dead, and of the original corporators, only three survive, viz: Franklin N. Drake, Ferral C. Dininny and Henry H. Cook. The Blossburg Coal Company immediately after obtaining their charter commenced the construction of a railroad from Blossburg southwest up Johnson Creek to their coal lands, a distance of about four miles. This railroad was completed during the year 1866. While the road was being constructed the opening up of the mines was carried on with activity. A saw mill was erected and the construction of dwellings, shops, schutes, stores, offices, etc. were hurriedly built. For a time this new coal town was known as Drakeville, in honor of Franklin N. Drake, the executive manager of the company; but it was finally christened "Arnot" in honor of Hon. John Arnot, Sr., of Elmira. In 1867 Mr. Franklin N. Drake removed from Steuben County, New York to Blossburg, in order to be near the work. He was for many years the President of the Company and Ferral C. Dininny, Superintendent. Under his management (F. N. Drake’s), churches and schools were erected. He demonstrated the feasibility of making coke from semi-bituminous coal, causing two hundred coke ovens to be constructed under the immediate direction of S. B. Elliott, civil and mining engineer. The first inhabitants were principally from Blossburg, Morris Run and Fall Brook, men who had been engaged in mining or lumbering at those places. The Dunsmores, Sullivans, Landrus, Camerons, Herons, Jones, Davis’s, Coles, Allens, Harrisses, Logans, Dugans, had formerly been employed by either the Morris Run Coal Company or the Fall Brook Coal Company. --There are four schools in Arnot. --Arnot contains about 3,000 inhabitants. --For many years the citizens of Arnot maintained a reading room. --Fred Wingrave has been employed many years by the company. --Arnot contains five church edifices and seven church organizations. --The company own a steam fire engine which is housed near a reservoir of water. --November 28th, 1880, coal washer destroyed by fire at Arnot. Loss about $20,000. --Col. W. F. Fox was for many years cashier at Arnot, handling large sums of money. --William Harris made the first coke in open pits at Arnot before coke ovens were constructed. --Mr. Jason Higgins has served the company in the capacity of store agent for many years successively. --In May, 1884, destructive fire in the woods surrounding Arnot. Seventeen buildings were destroyed in Arnot. --The Blossburg Coal company are engaged largely in lumbering, having three mills whose total capacity is 30,000,000 feet. --When F. N. Drake was president of the company he gave the miners and their families a free ride to Elmira and return. --The site of Arnot was covered with a dense growth of timber, when the Blossburg Coal Company commenced operations in 1866. --Since the mines were opened up to date there has been mined and shipped over four million tons of coal and about three hundred thousand tons of coke. --The population of Arnot is composed of a very great number of different nationalities, among whom are native Americans, English, Irish, Scotch, Welsh, Swede, Poles, and Germans. They live very peacefully together. --Henry J. Landrus has been the active manager at the mines at Arnot for the past three years. He served several years before in the same capacity and resigned, S. B. Elliott, taking his place. Mr. Elliott after several years resigned and Mr. Landrus again accepted the position. --The Blossburg Coal Company purchased the Tioga railroad, extending from Blossburg to Lawrenceville and from Blossburg to Morris Run, which added to their own road made them the owners of thirty-four miles of first-class railroad. This was accomplished in the year 1867. --Arnot contains "A Friendly Society," Ivorites, Catholic Temperance Association, Good Templars, Patrons of Temperance, Catholic Knights of America, Knights of Pythias. There are quite a number of Odd Fellows and Free Masons, but they are members of Blossburg lodges. --Andrew Bowers, Dr. D. C. Waters, James Cameron, John Cameron, William Dunsmore, John Dunsmore, John J. Davis, Alexander Logan, Samuel Heron, James Smith, John McKay, James Cleary,John Hill, Thomas M. McCay, Jason Higgins, Richard Smith, Fred Wingrave, George Lee, John Burke,Nicholas Shultz, Michael Clark, Campbell Cole, James Patterson, Theodore Williams, George Tylee,Charles Logan, William Bowers, Frank Howland, William Reynolds, W. R. Logan, Robert Pendleton,Thomas Llewellyn, H. G. Boardman, R. F. Cummings and E. K. Mandeville have held prominent positions under the company.